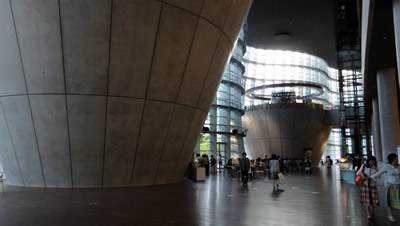 The museum was completed in 2007 and is the newest of the 5 national museums in Japan. The building was one of the last works of famed architect Kisho Kurokawa. The cafeteria and museum shop are located on the basement floor, cafes are located on the first and second floors, and a French restaurant is located on the third floor. Be sure to check what kind of exhibitions are on display when you’re planning to visit. Admission fees vary based on exhibition. The museum is open from 10:00~18:00(~20:00 on Fridays) and is closed on Tuesdays and holidays. The National Art Center can be accessed from Nogizaka Station or Roppongi Station. Keep in mind that Nogizaka Station is closer to the museum than Roppongi Station.